At the start of the 19th Century, would be fashionable resorts were coming into being all along the South Coast to cater for the new fashion of sea bathing made popular by George III and the Prince Regent (later George IV). It was to satisfy this desire that the Crescent and the Anglesey Hotel came into being. 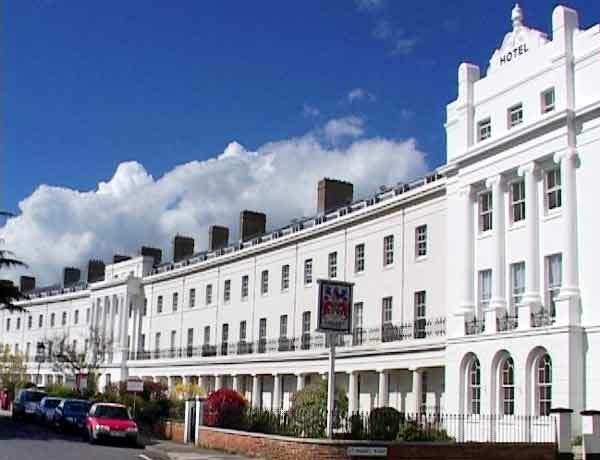 The actual architect of the Hotel and Crescent is not known but is believed to be Portsmouth architect Jacob Owen, Assistant Clerk of Works to the Royal Engineers Dept. of the Board of Ordnance. The Hotel, and the Crescent, the brainchild of local entrepreneur Robert Cruickshank, was completed in 1830. It is due to him that Gosport is able to boast such a fine example of monumental seaside architecture. As usual in those days, aristocratic patronage was necessary for continued success, Cruickshank was fortunate in persuading the First Marquis of Anglesey (The hero of the battle of Waterloo, where he lost a leg) to lay the foundation stone. This took place on the 19th September 1826. Unfortunately due to illness the Marquis could not be present and the ceremony was performed by his son the Earl of Uxbridge using a specially made silver trowel, still in the possession of the present Marquis. It is inscribed "The first stone of Anglesey Ville was laid by the Most Noble Marquis of Anglesey on the 19th of Sept 1826"
In order to attract people to Anglesey a race course was put down. At the first race on the 28th August 1832 the Senior Steward was Lord Charles Wellesley [of the famous Family]. There were six runners over a distance of one mile, the winner being "Fleur-de-Lys". When Robert Cruickshank died on the 13th February 1853 the Anglesey Hotel was left to his widow Harriet Susanna, who by conveyance dated 4th July 1861 disposed of it to Richard Henry Wyatt of Grosvenor Place, Hyde Park, London for the sum of £2,454 16s 5d. This included the adjoining house which at the time was used as part of the hotel plus a parcel of land to the rear of the hotel. In 1878 Wyatt sold the property to Samuel & Thomas Blake [Blake's Breweries] for the sum of £1025. Noted visitors to the hotel have been frequent in history. It was one of the great south coast hotels patronised by some of the celebrities of the day. Mainly of Royal Naval heritage, due to the close proximity of the Naval Dockyards and Establishments. Princess Victoria [Later Queen Victoria] stayed at the hotel in 1830 when she came to Gosport with her mother Victoria Maria Louisa of Saxe-Coburg, the Duchess of Kent. In October 1839 it is recorded that Capt. Charles Austin (Jane Austin's sailor brother) dined at the hotel and gave a speech in honour of Robert Cruickshank. Gosport once had it's own racecourse. The first race was run in 1832 and the winner was called "Fleur-de-Lys". The Hotel, and the Crescent, the brainchild of local entrepreneur Robert Cruickshank, was completed in 1830. It is due to him that Gosport is able to boast such a fine example of monumental seaside architecture.